The ITUC has today written to the Shenzhen authorities to protest at the brutal stabbing of Huang Qingnan, a worker from a local Shenzhen-based labour advice and support centre. 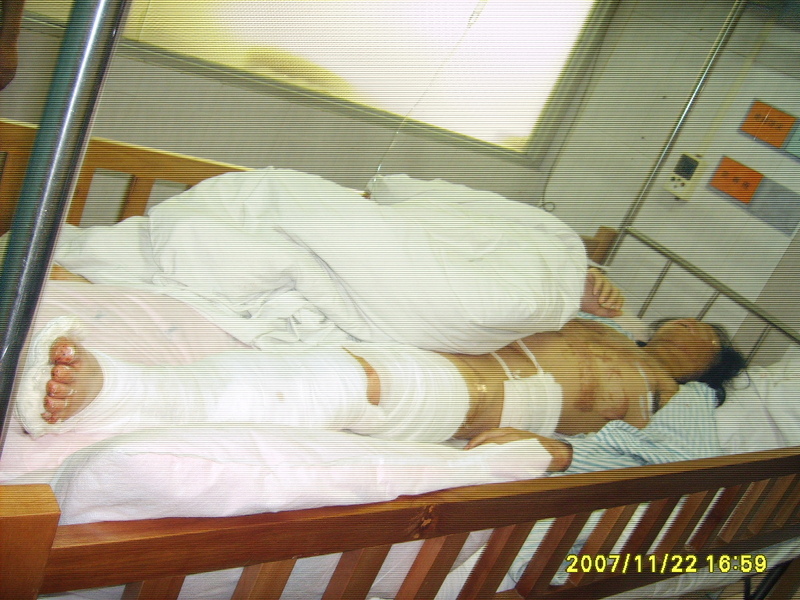 Brussels, 27 November 2007: The ITUC has today written to the Shenzhen authorities to protest at the brutal stabbing of Huang Qingnan, a worker from a local Shenzhen-based labour advice and support centre. He remains in a serious condition (picture) and may lose one of his limbs. Two previous attacks in recent weeks have targeted the centre itself. In a letter sent to Xu Zhongheng, Mayor of Shenzhen, the ITUC charged that Huang, a legal representative of Shenzhen’s “Dagongzhe” Centre, was attacked near the centre’s’ offices and severely wounded on 20 November by two men armed with knives. He was reportedly stabbed repeatedly and left with knife wounds over 10 cm. long. 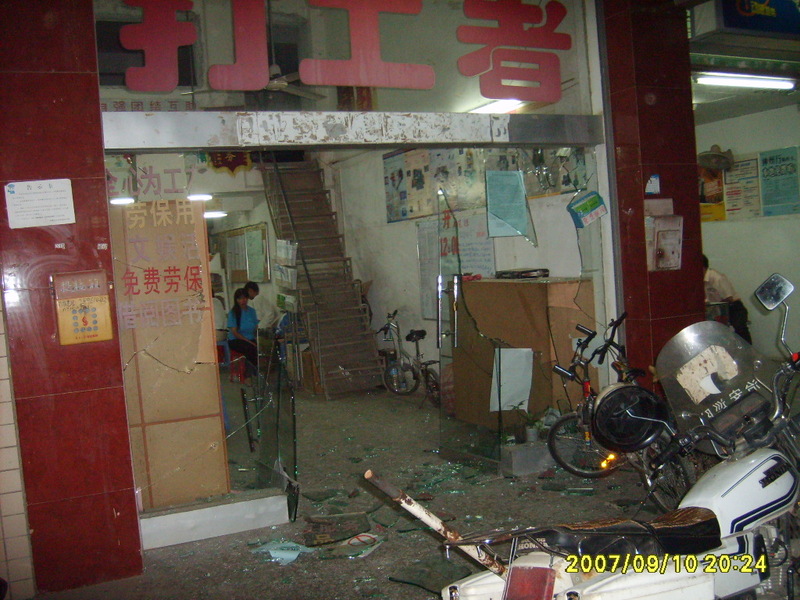 The centre itself had been ransacked in two previous attacks, on 11 October and 12 November 2007. Photographic evidence available to the ITUC shows the centre was thoroughly devastated (picture). These attacks appear to be connected to a larger campaign directed towards the centre and in particular its work with migrants, in the run-up to the implementation of the new Labour Contract Law, which will come into force on 1 January 2008. Reports from the Shenzhen area indicate many workers are being beaten or verbally threatened when they try to claim unpaid or missing wages in connection with layoffs taking place prior to the implementation of the new law, which provides safeguards for longstanding workers. Reports of employers dismissing longstanding workers include major Chinese companies such as Huawei, China’s Central TV broadcasting company (CCTV), various teaching organisations and Wal-Mart. It now appears that this practice is being mirrored by more violent means to intimidate and threaten workers who try to resist these moves. The ITUC had written a letter on 25 May 2007 to the central Chinese authorities about the new law. While it remained concerned that core issues such as freedom of association had not been addressed in the Labour Contract Law, it said it regarded many of its provisions to be an improvement on previous legislation. It now says it has been monitoring the situation of the past few months with concern, noting increasing reports of mass lay offs of workers by companies, in an apparent attempt to shed longstanding workers before the new provisions which may protect their employment status with the company come into effect in the new year. In its letter to Mayor Xu, the ITUC said the recent attacks against the Dagongzhe Centre in Shenzhen were consistent with reports of increasing harassment, monitoring and surveillance of workers’ rights groups throughout China, but predominantly in the Pearl River Delta. It said many such groups were facing quiet but continued harassment from local officials as well as from various sources who had been pressurized into withdrawing support previously extended to them, for example in the form of official registration, tax matters and rental issues. The ITUC also expressed disquiet over a corresponding increase in the number of journalists and lawyers being detained and harassed about their work regarding labour rights issues and related civil society defense work. “These organizations play a vital role in the well being of local society and the welfare of the workers and the safety of their staff must be guaranteed”, said ITUC General Secretary Guy Ryder. “Unless the perpetrators of such vile attacks are brought to justice and punished in accordance with the law, the harassment of workers’ rights activists – both by officials and by companies – will continue and will only serve to hinder the development of the much talked about “harmonious society”, he added.